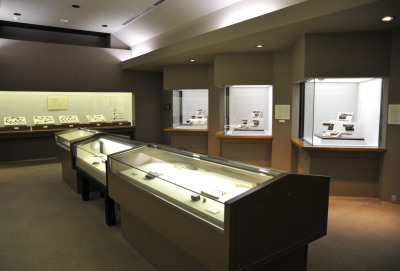 Mr. Shōichi Tawara is an attorney by training and profession and has been a dedicated collector of yatate for decades. To house his extensive collection Mr. Tawara built a three-story museum located in Ashiya, Hyōgo Prefecture, Japan located between Ōsaka and Kobe. His level of connoisseurship culminated in one of the broadest collections of yatate available to the public. The collection boasts several hundred museum quality yatate spanning the wide range of styles, themes and materials. Lastly, I wish to thank Mr. Shinichi Tarwara for his gracious permission to use photos of yatate from the museum’s collection in this website. The Tsubame Industrial Materials Museum is an eclectic gathering of metal yatate and smoking pipes, metal housewares including an array of kettles, spoons and other items. The museum was established to compile, preserve and exhibit the craftsmanship of Tusbame's metal work artisans. Tsubame city has been well-known as a "hardware town" and a "craftsman town" since the Edo period. The main building contains an exhibition of traditional metal manufacturing techniques. The exhibit includes the restoration of a workshop for the manufacturing of tsuiki copper-wares (hand-hammered copperware). The Annex houses metal yatate (approximately 269 but not all on display), and Edo and Meiji metal pipes, kiseru, from the lifelong collector Seijiro Maruyama (1900-1980). The collection includes metal pipes engraved by such noted metalsmiths as Natuso Kan and Shomin Unno. The entire museum is a real treat to visit and not to be missed if you're in the area. 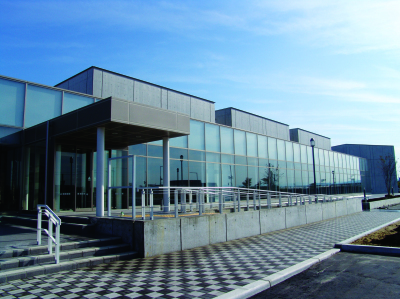 The exterior of the Tsubame Museum. The Annex, Yatate Kiseru Hall.